Hi. My name is Blarg. I am looking for a boy named Blake. I am Blarg the Monkey. Blake is a boy who is loved by a knitter, which is a very good thing. I have 9 green hairs and big green ears because I have supersonic hearing. I have pink lips. I have a brown tattoo on my left shoulder. However, you cannot kiss my pink place under my tail because this is where I keep my Secret Monkey Powers. This is my friend Amy who is not a Monkey. 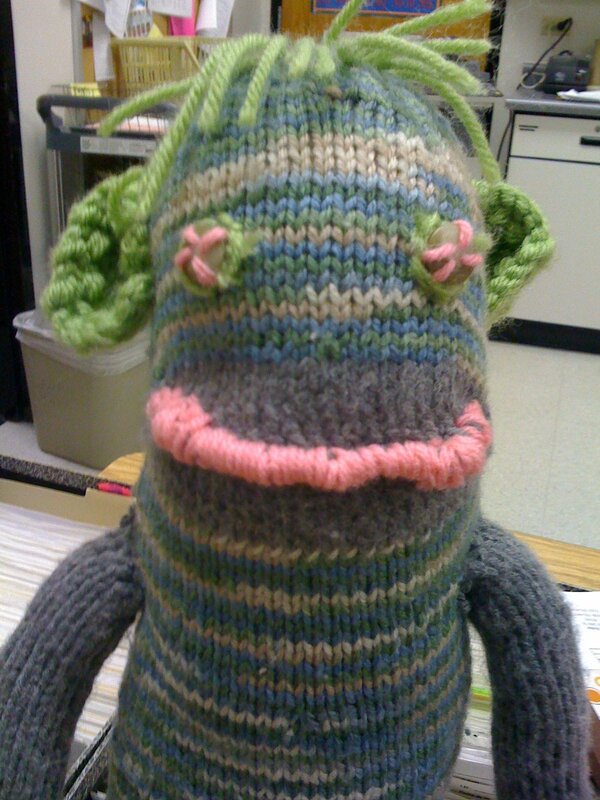 She also has a friend who is a knitter.This is a good thing. When she wears her hat she has Special Powers, but not Special Monkey Powers. Good bye. Must go find my friend Blake and get into some Monkey Business….